Mr. Falworth spent 12 months of his specialist training as a Sports Surgery and Arthroplasty Fellow at the world leading SPORTSMED.SA facility in Adelaide, Australia. Whilst at SPORTSMED, Mr. Falworth was exposed to the prevention, treatment and rehabilitation of a range of ailments, sports injuries and conditions affecting recreational athletes, as well as professional national and international sportsmen. Mr. Falworth has continued to refine the techniques necessary to restore function to patients suffering symptoms from sports related shoulder and elbow injuries and is committed to delivering excellence in orthopaedic and related treatments to people of all ages and levels of physical activity. 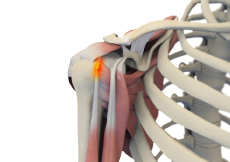 Subacromial impingement is one of the most common causes of pain in the shoulder. 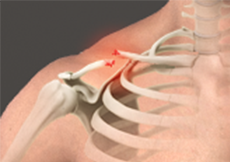 It occurs when there is a reduction in the space between the rotator cuff tendons and the overlying bone, the acromion. 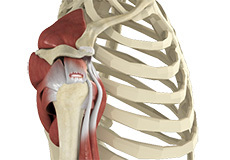 The rotator cuff is a group of four muscles which envelope the ‘ball’ of the shoulder joint (the humeral head). The muscles help lift the arm but are also instrumental in keeping the humeral head down and away from the overlying bone in the shoulder, the acromion. 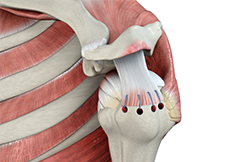 Between the acromion and the rotator cuff muscles is the subacromial space and providing this space is preserved there should be ample room for the tendons to glide under the acromion. 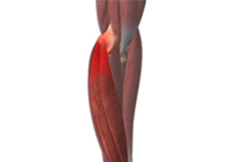 If there is not enough space, then the tendons can be damaged. 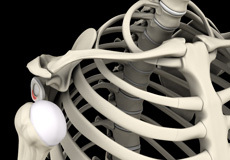 The shoulder is the most mobile joint in the body and as such a complex arrangement of structures are required to stabilise the shoulder during movement. The clavicle (collar bone) is an integral part of shoulder stability and function as it helps support the shoulder and the scapula (shoulder blade). 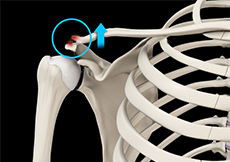 The clavicle forms a joint with part of the scapula called the acromion. This joint is termed the Acromioclavicular Joint (ACJ) and permits very small movements between the scapula and clavicle during normal shoulder movement. However, unfortunately this joint can be prone to injury. 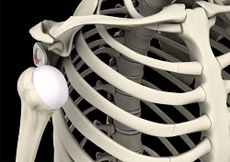 The clavicle (collarbone) is a bone that spans between the shoulder and the sternum (breast bone). It has a couple of important roles; the first is that it acts as a strut keeping the shoulder in the correct position and preventing it from collapsing into a more forward position. Its other role is to protect the very important blood vessels and nerves that lie just beneath the clavicle, in the neck. Tennis elbow, also known as lateral epicondylitis, is a degenerative condition affecting the tendons that insert into the bony prominence on the outside (lateral) aspect of the elbow. Golfers elbow, also known as medial epicondylitis, is a degenerative condition affecting the tendons which insert into the bony prominence on the inside (medial) aspect of the elbow. It is almost identical to a tennis elbow however unlike a tennis elbow, it affects the inside aspect of the elbow. If the symptoms associated with the rotator cuff tear are such that treatment is necessary, a rotator cuff repair can be undertaken. 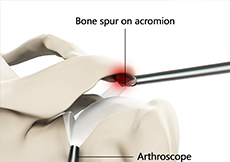 If acromioclavicular joint (ACJ) arthritis or a meniscal injury has developed, then ACJ related pain can develop. If the pain is resistant to non-operative treatments, then surgical intervention in the form of an ACJ, or distal clavicle excision, may be necessary. The stabilisation of a dislocated Acromioclavicler Joint (ACJ) can be undertaken in a number of different ways depending on the nature of the dislocation and the time that has passed since the initial injury. 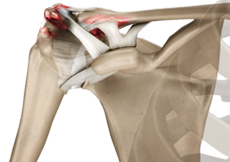 The nature of shoulder instability is complex and any treatment or operation will always be tailored to the patient’s pathology. 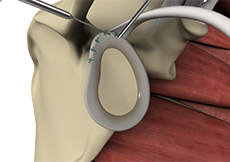 However, most stabilisation procedures will usually involve an arthroscopic procedure in which a torn labrum is either repaired back to the glenoid (socket) rim or alternatively, lax capsular tissue is tightened or plicated. 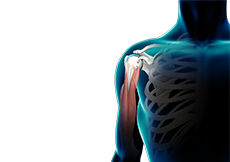 The effect of these procedures is to provide greater security to the shoulder joint so that shoulder stability is restored. A SLAP (Superior labrum anterior and posterior) tear can develop after either recurrent shoulder dislocations or secondary to the excessive mobility of the long head of biceps tendon. 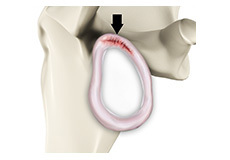 Overhead athletes are particularly prone to this injury, and if after a full clinical and MRI assessment, it is decided that this needs to be repaired, then an arthroscopic (keyhole) procedure will be needed. 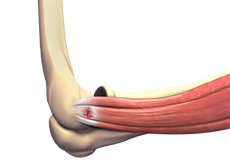 The aims of a Tennis Elbow Release is to excise the diseased tendon tissue, which is the perceived source of the pain, and then create an environment for the normal tendon to heal back to the bone. This is done through a small incision, measuring approximately 3-4 cm over the bony prominence on the outer aspect of the elbow. The surgery is usually performed as a day case procedure and you are discharged from hospital in an elbow bandage with a physiotherapy programme which slowly encourages the elbow back to full function over a three month period. 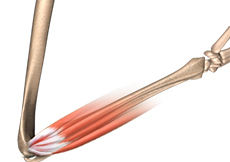 The aims of a Golfers Elbow Release is to excise the diseased tendon tissue, which is the perceived source of the pain, and then create an environment for the normal tendon to heal back to the bone. This is done through a small incision, measuring approximately 3-4 cm over the bony prominence on the inner aspect of the elbow. The surgery is usually performed as a day case procedure and you are discharged from hospital in an elbow bandage with a physiotherapy programme which slowly encourages the elbow back to full function over a three month period.